If you read to the bottom of the little article you will see that Dave has a solution to extensive flatulence in dogs ... he sounds like an incredibly mean guy on video. Here is his pictoral sin, Dave is 2nd from the left. Then Obamacare came along and that ability vanished. He’s spent the past several years traveling back and forth to Washington and Boston talking to every official he could find to complain about that portion of the law. 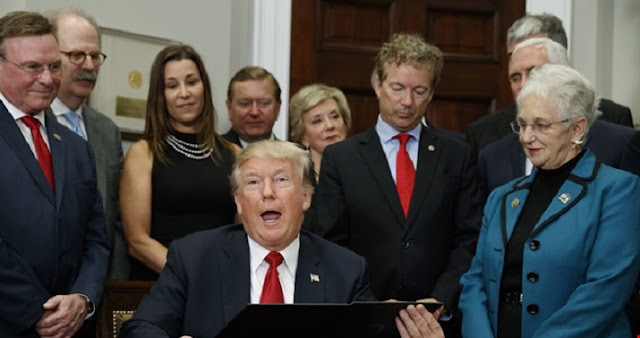 It turns out that Trump’s recent executive order rolled back that part of Obamacare so the group could negotiate for better rates again and the National Retail Federation sent Dave an invitation to go to Washington and attend the signing. Now, we know that the official media narrative is that BOcare did nothing but good, and that any rollback is doing nothing but evil. Someone living in the real world might guess that narrative is significantly wrong, but considering the MSM anything less than gospel is not allowed -- certainly not in Massachusets! Welcome to social activism on the Left in 2017. A guy who provides 150 local jobs and serves a popular (if eclectic) consumer niche was trying to find a way to get more affordable group health insurance for his workers. When that goal was achieved he accepted an invitation he’d never asked for to go to the White House and celebrate that achievement. And now the liberal hordes on social media are trying to shut him down. Over a photgraph. Great job, guys.